Harbour Chines is a prestigious, upscale neighborhood in western Coquitlam, British Columbia. Additionally, Harbour Chines boasts a great location just a few minutes south of Port Moody. The boundaries of Harbour Chines are roughly Como Lake Avenue to the south, Highway 7A to the north, Thermal Drive to the east, and Robinson Street to the west. Harbour Chines is family-friendly and has two elementary school nearby. Como Lake Park is a central feature of Harbour Chines which boasts prestigious, well-maintained homes. The area surrounding Harbour Chines experienced a burst in population at the end of WW II, which is still being felt today. Coquitlam had a population of approximately 126,840 residents at the time of the 2011 census. The opening of the Lougheed Highway in 1953 dramatically improved accessibility to Coquitlam and neighboring areas. Coquitlam has a total area of a little more than 152 square kilometers, more than Port Coquitlam and Port Moody, the other two cities which makeup the Tri-Cities area. Students in Cape Horn attend schools of District 43, which has four secondary schools, seven middle schools and numerous elementary schools. 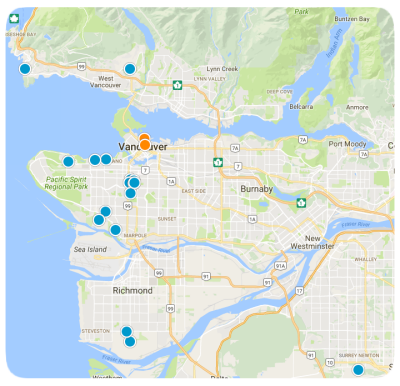 Additionally, Simon Fraser University, the University of British Columbia, and the British Columbia Institute of Technology are all located nearby. Harbour Chines offers something for every home buyer but especially for the more discriminating buyer. The best in Lower Mainland real estate is available in Harbour Chines. It is not unusual for homes in this area to have a gourmet kitchen, wine cellar, resort-style pool, outdoor space for entertaining, grand balconies and more. Condominiums, townhomes, single-family homes and lots upon which to build a custom home are all real estate options available in the area surrounding Harbor Chines. Condominiums are rare in this community but one was recently on the market for around $888,000 featuring 4 bedrooms and 3 bathrooms. Single-family homes start around $985,000 and go up in price to approximately $1,790,000 for a home with upscale amenities. Lots are less plentiful than existing homes, however, lots can be found starting at approximately $649,000 and going up to around $2,150,000, depending on the size of the lot and the desirability of location. Contact us today with any questions or to schedule an appointment to see one of our properties in beautiful Harbour Chines or any neighboring community of Coquitlam, British Columbia.